Hydroponic grow systems are highly efficient waterculture growsystems which use special plantpots and an automated irrigation & nutrient feeding system to grow your plants in a water-based environment, instead of cultivating in soil or on substrate. Hydroponics systems can be used for any amount of plants or seedlings, and can be fully automated and programmed, depending on model. Hydroponic systems are an ideal way to guarantee healthy and high yield plants the easy way! 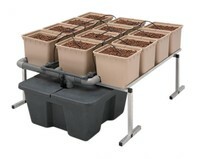 The GHE Ecogrower is a hydroponic dripping system for 6 plants, including pump. GHE RainForest² 236 is ideal for propagating cuttings or quick-starting seeds and seedlings. AeroFarm is the most economical of all GHE aero-hydroponic systems. The new GHE Panda Aero systems allow you to grow from 8 to 40 plants. GHE Panda Hydro systems are a little smaller than the Dutch Pot systems, for 8 to 40 plants. GHE AeroFlo modular systems are high yield growing units for 10 to 120 plants. Choose your ideal system here! GHE AeroFlo 10 is our smallest modular cultivation system, for up to 10 plants. GHE AeroFlo 14 is a complete, modular cultivation system for up to 14 plants. GHE AeroFlo 40 is a complete, modular cultivation system for up to 40 plants. GHE AeroFlo 60 is a complete, modular cultivation system for up to 60 plants. GHE AeroFlo 80 is a complete, modular cultivation system for up to 80 plants. GHE AeroFlo 120 is our largest modular cultivation system, for up to 120 plants.